A Wounded Boy’s Silence, and the Candidates’ ‘I hate war,’ FDR declared 80 years ago. Why can’t today’s politicians say so? With the campaign proper about to begin, on Labor Day, a last August thought, a very simple one: War is terrible. It is my impression our candidates for president don’t really know this. They never say it, not in formal speeches or in thinking aloud, in reveries in friendly interviews. I would say of most of America’s political class that they have their heads all screwed up about war, that they approach the subject coolly, as a political and geopolitical matter, and that they see it through prisms of personal political need and ideological gain. They are missing the central fact of it—that it is terrible. Before the election is over it would be good if someone said it. The thought arises most recently from the harrowing photo and videotape of the 5-year-old boy in Aleppo, Syria. You have seen one or both. His name is Omran Daqneesh and he lived with his parents and three siblings in the rebel-held Qaterji neighborhood, which late Wednesday night last week either Russian or Syrian forces targeted in a brutal airstrike. 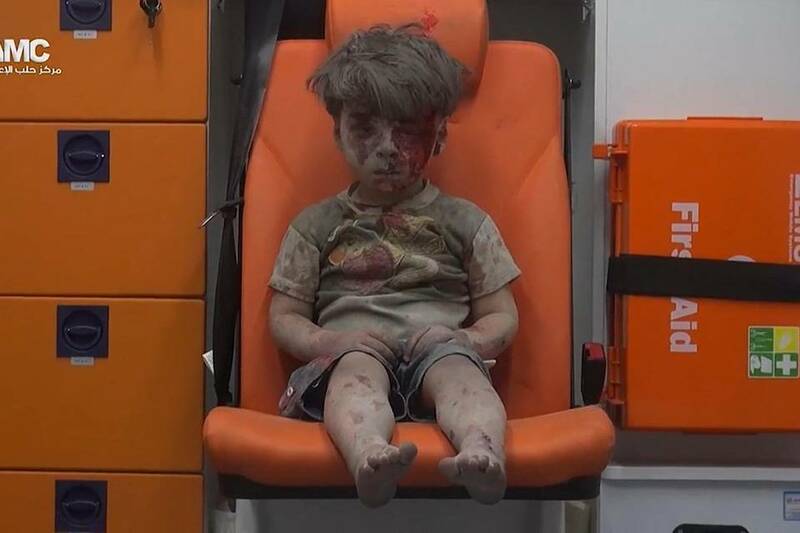 Omran was pulled from the rubble. He was placed on a seat in the back of an ambulance. Five-year-old Omran Daqneesh after being pulled out of a building hit by an airstrike in Aleppo, Syria. The left side of his head was covered in blood. His thick dark hair was stiff from smoke and dust. His legs were marked by soot and what looked like bruises. One report said he’d been in the rubble an hour before they dug him out. They wouldn’t let the ambulance go until it was full. There was room for more children, and they came. But Omran is the one you can’t stop watching. He stares mutely, like a shocked old man. Photojournalists make flashes of light as they take his picture. No one has—or takes—a moment to call any comfort to him, to the 5-year-old boy as he stares ahead. He can’t fully see out of his left eye, which seems damaged. Tentatively, calling no attention to himself, he brings his left hand up to his head and touches around for the wound. He seems to find it, then puts his hand down on his legs, as if not to call attention to his wounds. Watching the videotape, posted on YouTube by an anti-Assad group, you see what is most harrowing. It isn’t only his youth, his aloneness, the blood—it’s that he isn’t crying. Children, by nature and instinct, cry when they are infants. But as they grow older, 3 and 4 and 5, crying is sometimes more of a decision. Children who know they’re cared for cry in the expectation that someone will comfort them. If by 3 or 4 you haven’t had that, or haven’t had that enough—if circumstances were harsh enough that you couldn’t rely on help or comfort—then you might not cry. Because it won’t bring the help you need, or may in fact bring negative responses. For all 5 years of his life, Omran Daqneesh lived in a country wracked by civil war, surrounded by the tension, fear and hardship war brings. Anyway, he didn’t cry. He was taken to a local underground hospital called M10, treated for head wounds and released. There are reports his older brother has since died. About 18 months ago I asked a potential Republican presidential candidate, in conversation, if he hated war. He got the dart-eyed look politicians get when they sense a trick question. This startled me. How do you not know the answer? After a few seconds I said, “This is not a trick question.” I explained I was thinking of Franklin D. Roosevelt, who said, “I hate war,” roughly five years before prosecuting one with unambivalent vigor. It’s quite a speech, a deep and persuasive exposing of thoughts on the most essential of human and governmental subjects. But what really surprised me on rereading it was that I don’t think a Republican or Democratic candidate would feel free to speak like that anymore. They’d fear being called soft. That isn’t good, or even practical. FDR after all was pretty good at waging war. It only made him more powerful, made his decisions more convincing, that he’d laid down the predicate that he’d never wanted it and in fact hated it. As for Donald Trump, he is usually equally aggressive in speaking of potential U.S. military actions, though it’s clear he hates war at least for himself. He did not serve and famously told Howard Stern that dodging incoming STDs was his personal Vietnam. Our leaders are shallow on the subject of war. No, worse than shallow—they’re silent. Which is one reason they will likely not be fully trusted should they make rough decisions down the road on Syria, or Iran, or elsewhere. War is terrible. That should be said over and over, not because it’s a box you ought to check on the way to the presidency but because you’re human and have a brain. You should hate war. A 5-year-old knows that.